Amy and I are spending a week in Australia (so she can recover from the shock of going from summer in India to winter in Christchurch). It’s been unseasonably cold here for winter but it’s not any colder than Christchurch was last summer! We started in Port Douglas, which is north of Cairns, and went to the outer Great Barrier Reef for scuba diving. I ended up having to snorkel because I had a pneumothorax once. But it was all for the best because Amy got to go with the other certified divers instead of on the intro course with me. And the snorkeling was great because the reef was so shallow. I saw Nemo! And a Moorish Idol plus lots of wrasse and parrot fish. Amy saw a sea turtle and some reef sharks. 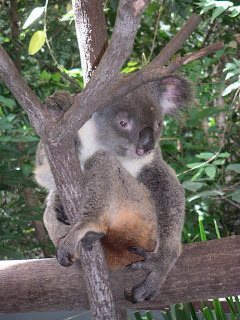 The following day, we went to the Rainforest Habitat where they had an aweome display of birds, koalas, kangaroos, wallabies, bats, emus etc from the Australian rainforest. The birds in particular were gorgeous - all sorts of beautiful colors. 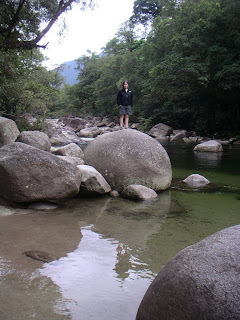 For two nights we stayed at the Mossman Gorge B&B. Great spot up on the hills with the most scrumptious breakfast of homemade croissants, fresh fruit, homemade jam and passionfruit butter. 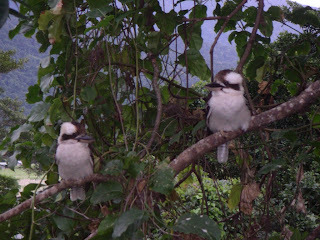 At breakfast the first morning, there were tons of birds including two koukaburras. 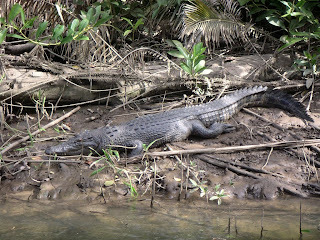 We took a boat ride on the Daintree River yesterday and saw crocodiles, kingfishers and a green snake. Most of the crocs were juveniles but there was one big mama. This morning we say a cassowary on the side of the road and then saw it again a few hours later on our way back. We consider ourselves lucky as there are only 1200 left in the wild. They are rather ungainly but regal looking creatures. I showed this photo to the woman taking us on our rainforest walk today and she recognized her as “Big Bertha”. The rainforest is awesome with trees that are hundreds of years old, some growing only a meter every 100 years! There are big blue seed pods called cassowary plums that have to go through a cassowary’s digestive tract before they can germinate. Apparently 37 species of plant require a trip through a cassowary before they can germinate. 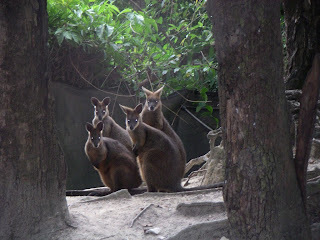 So that’s why they are worried about the low numbers of cassowaries. The other thing that seems to be essential around here is the mangrove trees. A lot of the fish on the reefs depend on them but I’m darn ed if I can remember why. Maybe they spawn around them or something. I guess I better look it up!